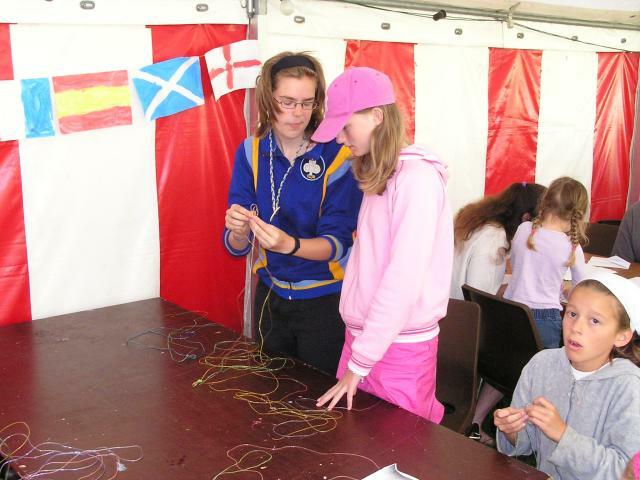 Tuesday morning Ceri-Siân helped out at kids club, this time with scoobidou. 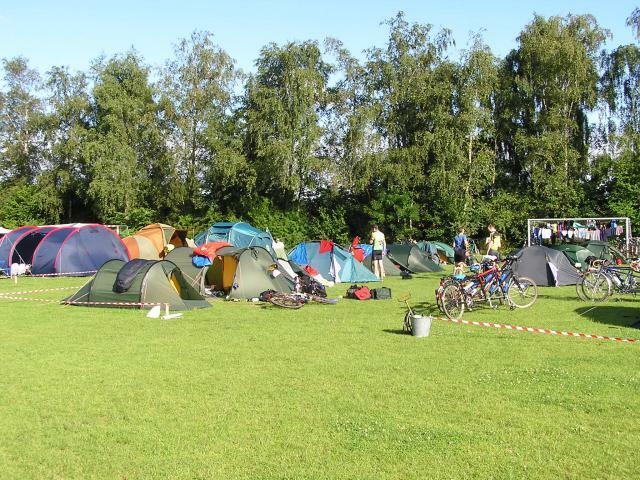 Tuesday morning was glorious giving an opportunity to air tents and sleeping bags. Despite the nice morning the washing on the line didn't dry very well. .
Tuesday's rides were out to Middlefart. 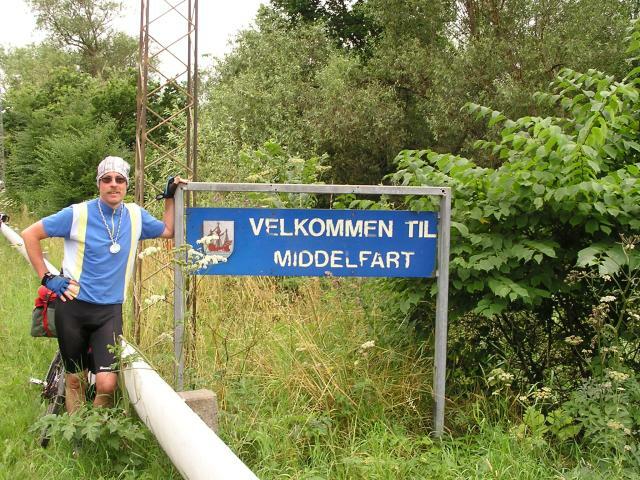 As the route to Middlefart and back was a bit far, we, along with some others took a train assisted ride. We got the 9:45 train from Tommerup to Federicia. We and Davies family went all the way. An American couple went as far as Middlefart, and Bella to the next stop at Aarup. 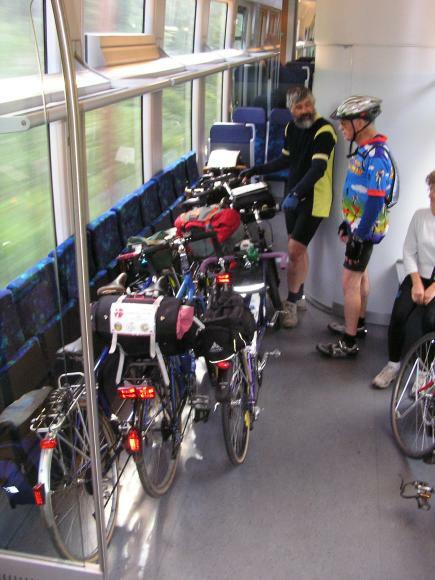 We had 3 tandems and 3 half bikes on the train, and still plenty of room for more. 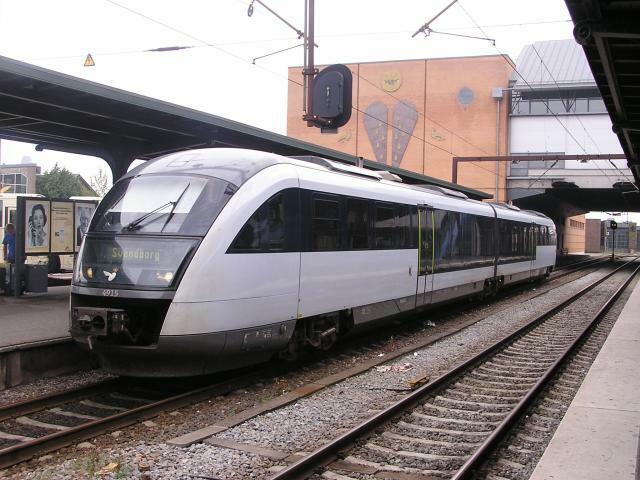 The type of train we used above is seen at Odense. As they were so tandem friendly many people made use of these trains during the rally as assistance to cover more ground. Middlefart is on the north west corner of Fyn, and is separated from Jylland by the Lillebælt. 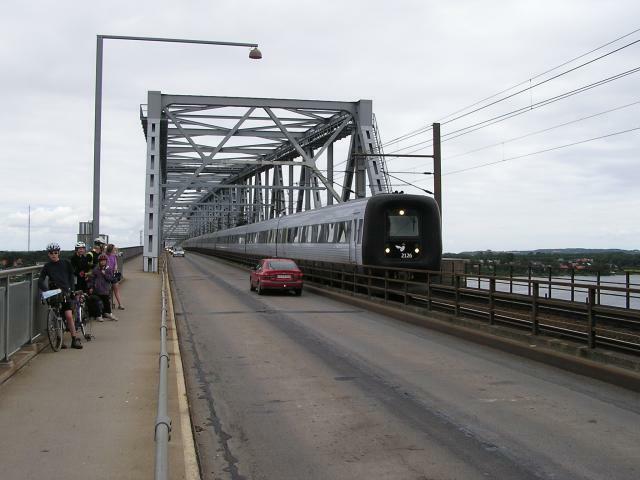 Until 1935, the only crossing was by train ferry. The bridge crossing opened as a road rail bridge and we wanted to make the crossing from Jylland by the bridge, as we had arrived on Fyn by ferry, also wanted to cycle on to Fyn by bridge from the mainland. Ceri-Siân wanted a photo of me by the Middlefart sign, I can not think why. From Middlefart we rode around the north coast of Fyn and had lunch at Røjle Klint. For years I have had a reputation for drumming up whenever and wherever I stopped. This year I took this to new extremes for lunch time brew ups. Not just brewing tea, hot chocolate or soup, but cooking omelette as well! 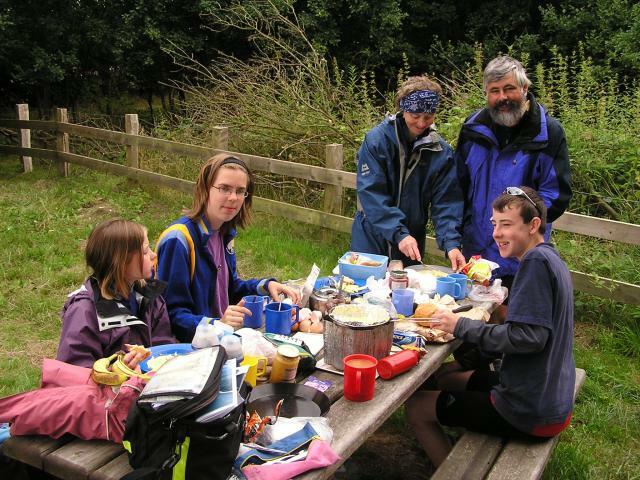 Here the Davies family and Ceri-Siân are tucking into freshly cooked omelette. We followed the coast as far as Båring Mark before heading inland back to Tommerup. The last 5 miles we followed the main road from Vissenejerg to Tommerup. 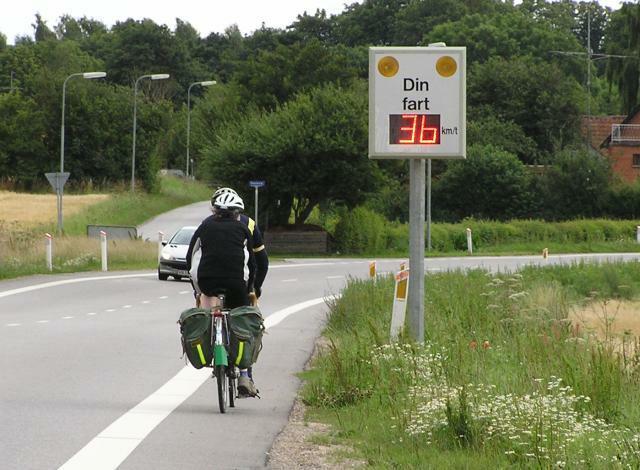 As you entered the village of Skalbjerg, there were "Din Fart" speed indicators. These are fairly common throughout Danmark. Some, not all, registered cyclist speeds. Here Hywel and Jackie Davies clock 36Km/hour. Tuesday evening there was a mass tandem ride from the rally site to Museum Lilleskov Teglværk, a brickworks museum about 2 miles from Tommerup. 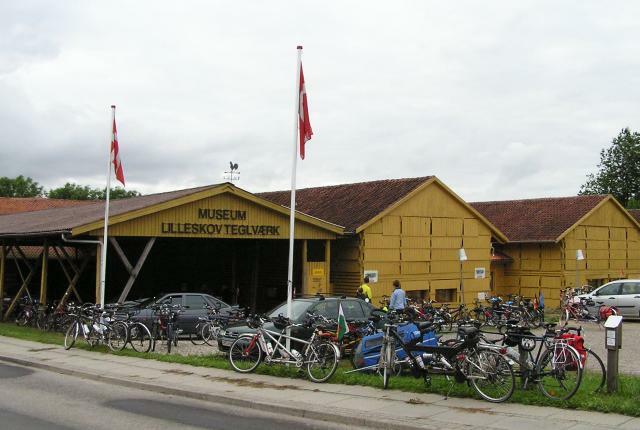 Museum Lilleskov Teglværk, the destination of the mass ride. Tandems, half bikes, trailers etc parked outside Museum Lilleskov Teglværk. Guided tours were provided around the brick works. Here is one group being shown around. 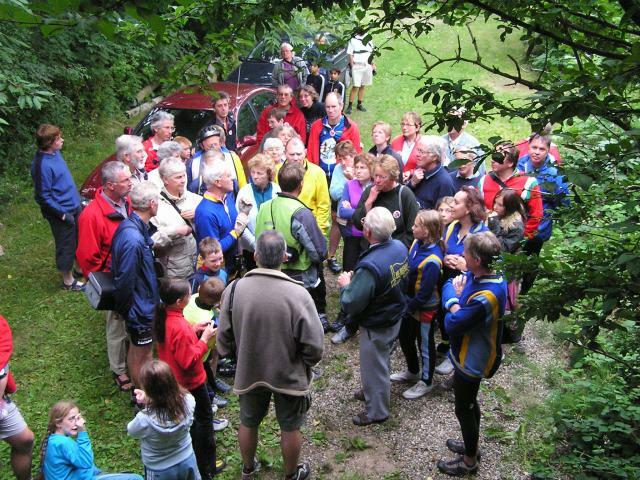 The younger elements and certain adults were more interested in the ride along part of the old railway that connected the brickworks with the clay pits. The gauge of the railway is 60cm.